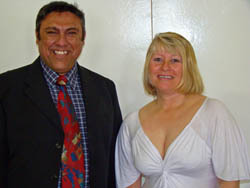 Conrad and his wife Sharon was based in Hitchin, Hertfordshire where he undertook further police training organised by Tristan Association Treasurer Brian Frederick with Hertfordshire Police. The highlight of his stay was attending the annual Overseas Territories Consultative Council held in London on 9th December and a visit to the Netherlands on 14th November for the launch of the cruise ship MV Plancius . 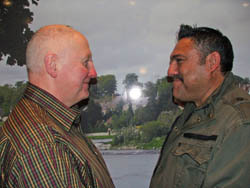 We report briefly on Conrad's visit here, and a full report and pictures will appear in the February 2010 Newsletter. Chris Bryant, the Overseas Territories Minister at the Foreign and Commonwealth Office in the UK, hosted the eleventh meeting of the Overseas Territories Consultative Council in London on 9 December. Chief Islander Conrad Glass led the Tristan da Cunha delegation to the meeting. Premiers, Chief Ministers and other elected representatives from Britain’s Overseas Territories also attended the meeting. “My focus this week has been very much on the Overseas Territories. I had meetings with all the Territory leaders on Monday, chaired my first Overseas Territories Consultative Council on Wednesday and was pleased to welcome over 250 guests to a reception that I hosted in honour of Territory leaders that evening. We have covered a lot of ground over the past three days. Our discussions have been wide-ranging, open and, at times, frank. Above all, I think they’ve been constructive. I hope Territory leaders would agree with that”. This year, at the request of Overseas Territory leaders, a Forum was held the day before the Consultative Council, on 8 December, to review the 1999 Government White Paper “Partnership for Progress and Prosperity – Britain and the Overseas Territories”. 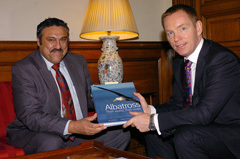 The White Paper established the principles that have guided the relationship between the UK and Territories since 1999. The Forum is the first stage of a consultation process on the future of the UK/OT relationship. 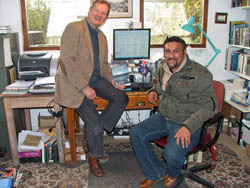 Chris Bryant had a bilateral meeting with Conrad Glass to talk about issues affecting the Tristan da Cunha community. They discussed a number of topics including education, healthcare and building Tristan Government capacity through the provision of on-island training. They also discussed the ongoing efforts to gain access to EU markets for Tristan da Cunha lobster, and the importance of both conservation and tourism to the island. 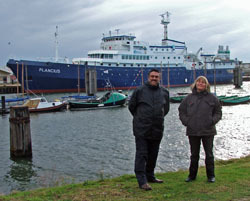 Chief Islander Conrad Glass and his wife Sharon, assisted by the Tristan UK Representative Chris Bates, travelled to Vlissingen in The Netherlands at the invitation of Oceanwide Expeditions, whose vessels since 1991 have been calling regularly at Tristan in the course of taking parties to and from Antarctica and the South Atlantic Islands. Iza had stood in for the Commissioner of the Queen of the Netherlands at 10 minutes' notice to name the ship! 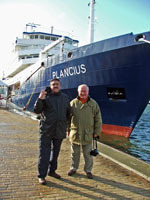 The vessel familiar to people on Tristan, MV Professor Molchanov, will call at Tristan in 2010: however she will be withdrawn and the new vessel the MV Plancius will make her first call at Tristan on April 13 2011 and will thereafter be a regular visitor to the island. The Plancius was built in 1976 as an oceanographic research vessel for the Royal Dutch Navy and was withdrawn from their service in June 2004 and eventually sold to Oceanwide Expeditions. She has been rebuilt as a 110-passenger vessel, compliant with the latest SOLAS regulations, classed by Lloyd's Register in London and flies the Dutch flag. Her officers and crew are predominantly from Murmansk, Russia, whose experience in dealing with ice at sea and the conditions to be found in the Arctic and Antarctic, is unrivalled. The Plancius has 53 passenger cabins, a restaurant/lecture room and an observation lounge and large deck spaces to enable passengers to see scenery and wildlife. The ship is equipped with 10 Mark V zodiacs; she has diesel electric engines which reduce noise and vibration and is ice-strengthened. There were many references in the welcoming speeches from the shipping line's operators to their gratitude to Tristan for the Chief Islander's attendance and several conversations with them about their plans to develop their business with Tristan. They frequently referred to their great affection for the island and its people, as well as the friendships between their ships' crews and islanders in making events such as visits to Nightingale Island possible. 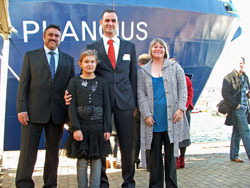 The shipping line also expressed its gratitude to Tristan Post Office for issuing stamps showing their vessels and raised the possibility of a new issue showing the Plancius: this is already being discussed with Iris Green at the Post Office. Connie Glass, 47, doesn't much like the London Underground. "I've got used to it," he says, "but at home we never have to queue to get from A to B while people in London rush to get those extra few seconds on the Tube." The Chief Islander of Tristan da Cunha has more reason than most to be dismayed by the rush-hour Tube. Every time he squeezes onto a train he is most likely cheek by jowl with more people than the entire population of 264 back home on the most remote inhabited island on Earth. Just getting to London from Tristan da Cunha is a logistical feat. With no airport, the island's most reliable link with the rest of the world depends upon two fishing boats and an Antarctic survey ship that visit the island a total of nine times a year between them. They connect to Cape Town, the nearest airport, 1,750 miles away. But as Chief Islander and visits liaison officer, Connie reckons the trek is worth it. For one thing, it allows him to attend the World Travel Market trade show at London's ExCel where he can meet the cruise ship operators that are a mainstay of the island's economy. Cruise ships provide important island income, with Tristan getting 10-12 ships a year usually carrying between 180 and 500 passengers on adventure tours to Antarctica. "We charge a harbour tax that covers the cost of our police department and then there is the money visitors spend. They are particularly valuable to the island's pensioners who make many of the handicrafts that we sell. "It's quite hard to get passengers ashore, though, because the harbour on the island is so small they have to transfer to small boats." "The World Travel Market is very good for us," he continues. "We are able to catch up with cruise firms such as Oceanwide Expeditions with whom we have a relationship and make useful contacts with other firms too. As the island's inspector of police and visits liaison officer, I'm in charge of immigration control," he explains. "That means I am visitors' first point of contact. Once they have seen me, they are referred to the island's tourism coordinator who arranges their itinerary. 'I'd been doing the job for a couple of years when I was asked to stand for Chief Islander. We have eight councillors who are elected by the community to handle day to day affairs and we have a Chief Islander who is elected to speak for the community. It's a role that's a bit like a mayor and I've made it my objective during my three-year term of office to promote and raise awareness of the island. Bird-watching is a huge draw for tourists. The Tristan da Cunha archipelago is a prime site for rare species, such as the flightless rail, which is the world's smallest flightless bird. Albatrosses and rockhopper penguins nest on the islands. In fact as Inspector of Police, Connie encounters more trouble from penguins than conventional crime, a state of affairs that prompted him to call his book about life on Tristan da Cunha "Rockhopper Copper". Connie, though, is keen to expand the island's appeal to visitors. "We see a lot of potential for adventure tours," he says. "We don't have the capacity for thousands of visitors but if we have 180-200, they can stay for one or two days and we can take them to Nightingale Island or Inaccessible Island to see the birds. "Then we have walking. It's a very strenuous hike to the top of the mountain on the island, which is 6,650ft high, and we have fishing, golf and historical tours which present how life used to be on the island. We also have the chance to promote scuba diving and sailing. There are unique opportunities but we need to attract the right sort of people. People are also fascinated by what it's like living on a volcanic island so close to a recent eruptive centre and lava flow. Connie is optimistic about the prospects for the island. As Chief Islander he attends the Foreign Office's annual Overseas Territories Consultative Conference. "That's where we argue for funding for development and education," he says. "My job is to convince the British government that if they help us now to improve the island's tourist industry, in the future we will become more independent so Britain won't have to fund developments such as improvements to the island's harbour and new roads. "We need expertise from Britain to help achieve our goals. There are very positive feelings towards the island and a tremendous amount of goodwill shown by the British government, which has sent out specialists such as an educational adviser to help us, but there is still along way to go." And while Connie is away from the island, promoting its interests, his neighbours will fill in for him in his absence. Someone will stand in as inspector of police in the unlikely event that a crime occurs; his patch of potatoes will be tended and his livestock minded. Island life is like that. Everyone looks after each other's interests. Connie would have it no other way. "At home we have peace and quiet and tranquility, " he says. "I appreciate it more and more every time I arrive back home." During my recent visit to the UK , I was surprised by how little was known by Government officials in London or the public about Tristan and our way of life. My objective was to raise awareness of Tristan with those whose decisions affect our lives, and to seek help and support from the British Government to manage and run the Tristan Government more efficiently. I attended many meetings with people responsible for Tristan and its future. There were three days of meetings of the Overseas Territories Consultative Council. That’s the forum which includes Tristan and the other territories which come under the British Crown: the Falklands , St. Helena , Montserrat , Anguilla , Bermuda and some others in the Caribbean , as well as the Pitcairn Islands . I had a friendly and very positive one-to-one meeting with the new Minister responsible for these territories, Gillian Merron MP (whose full title is the Parliamentary Under Secretary of State for Overseas Territories ). In the House of Commons, I took part in the Foreign Affairs Committee’s hearing on reaction from the Overseas Territories to their recently-published views of our future. Again, I was able to put Tristan’s case. It would not have been heard if I had not been there. There were several meetings in the Foreign and Commonwealth Office and with officials from other important Government departments, agencies and companies with a direct and very real influence over Tristan’s future. They included the Department for International Development (DFID), the Crown Agents Bank (and CASCO who are the private company formed with Crown Agents to supply our stamps), and the Commonwealth Mint, who have the contract so supply the Tristan coins sold to collectors around the world. I had meetings with specialists working in the areas of Child Protection and Human Rights. They cover areas of international obligation to which the British Government has signed up, so it was essential to explain our way of life on Tristan and our standards, as these laws and regulations directly affect us and the way we govern ourselves. I was also able to discuss the Disaster Management Plan for Tristan directly with the people responsible for it. I went to Sandy in Bedfordshire to the headquarters of the RSPB (Royal Society for the Protection of Birds) to meet those responsible for that charity’s work on our island. With a view to developing our income from tourism and especially from cruise ships, I spent a day at the World Travel Market, in which all the world’s tourist boards and major travel operators get together in London to try to persuade those in the travel trade to do business with them. Tourism is the biggest single industry in the world and I wanted to tell them about Tristan and to see how we could develop things here without harming our way of life. There were two major trips away from London . 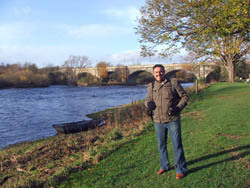 At Kelso in Scotland (where William Glass came from) I met members of the Scottish Small Islands Film Trust who are planning a Tristan-themed Film Festival in that town late next year. They want to involve Tristan’s children and young people in making a film to be shown as the centrepiece of that event. They’ll offer expert help from the University of the West of Scotland. The idea has been warmly welcomed by the Minister (Gillian Merron) and all Tristan’s stakeholders in the UK . I found there is a huge interest in Scotland in our island and a great enthusiasm for anything to do with Tristan. That has to work to our advantage. In Yorkshire , I looked at how Britain is breaking away from dependency on fossil fuels at a time when evidence over climate change and the damage caused by pollution from oil, coal and gas is causing a complete rethink on how power is generated and used. Wind turbines, wave energy, hydro electric power, even thermal energy from underground hot rocks – they are no longer the stuff of cranks and hippies’ dreams. Increasingly, through laws linked to international treaties, they provide an alternative to fossil fuels such as oil, gas and coal. Up on the Pennine moors where the climate is every bit as bleak and wild as ours, I was able to see these huge turbines whirring away in the wind, feeding pollution-free power into the National Grid. In the same area of Yorkshire , I also had the chance to see how small communities develop their own tourism and earn their living from it. This helps them keep alive the character and the history of their communities. Obviously it set me thinking what lessons there are from this for us on Tristan. I came away from each meeting feeling optimistic and enthused by the positive attitudes of the people I met. This was reflected in their desire to help and support the people of Tristan. Policies are now being put into place to enable our community to achieve a more prosperous lifestyle and to be able to sustain it. The new crane, the work on the harbour, the new Education Adviser – they are just the tip of the iceberg. There is more to come. However it’s up to us to embrace the offers of support and to build on them. To do this we need to change some of our attitudes -- our ways of thinking, and not to look at the Government as a private firm or sector. We, the people of Tristan, are the Government. We are all stakeholders in this enterprise. We need to respect and care for these resources, with the same commitment we show to our homes and patches. Policies will have to be implemented over time to bring Tristan into line with international Human Rights’ legislation, with payments on private imports, with encouraging private business: things that’s been done already in the outside world. The good news is we don’t have to follow the exact same policies of the EU or UK . We take what’s on offer and adapt it to suit Tristan and our way of life. I emphasised to all the officials and politicians I met in London that we did not want to have money funded in the same way as St Helena . We want to retain our independent way of life: to make changes for the benefit of the community; without undermining the ethos of our way of life -- that is, the family ties that binds the community together. In short- provide us with the management, the education and the training- the tools we need to do the job ourselves. Our present way of thinking stems from living a lifestyle in a sheltered environment, with the Administration and powers-that-be taking care of decisions for us. Reality has finally caught up with Tristan! Either we adapt and make decisions and policies to retain our independent way of life so that we can earn our living in the wider world and pay our way…or have DFID (Department for International Development) come and run the island for US? That’s what happens on St. Helena and Montserrat and it will mean that DFID will tell you what you can and cannot spend your money on to run Tristan’s economy. That will affect our wages and welfare and the future of our children and their children. We have to show we are using this investment in Tristan wisely and productively: that it’s not an endless subsidy or an expectation of hand-outs for ever at a time when millions of taxpayers in Britain have lost their jobs and their savings in the economic collapse, when tens of thousands there have had their homes re-possessed and their businesses bankrupted. Many in the UK are asking how will their hospitals, their schools, their safety and security be funded at such a desperate time. So the Island Council and myself need the support of the community to move Tristan forward to a prosperous future, and in turn we need play a wider role to achieve our goals. We have a valuable asset in our UK Representative Chris Bates. He gives Tristan 100% commitment to reaching a brighter future. Without his help and guidance I could not have achieved what I did for the Community on this visit. I am sure it will be the same for future Chief Islanders who work with him. 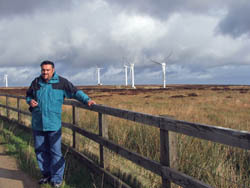 Conrad at Ovenden Moor Wind Farm in the Pennines where bleak and blustery conditions resemble Tristan’s weather. set off to settle Tristan da Cunha . (Scottish Small Islands Film Trust); Chris Bates; Conrad; David Mackenzie (Glasgow-based film director); Ray Burnett (Benbecula-based island historian and trustee of Scottish Small Islands Film Trust). 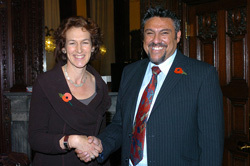 Foreign Office Minister Gillian Merron holds a bilateral meeting with Mr Conrad Glass, Chief Islander, Tristan da Cunha in London, 30 October 2008. The photo, left, courtesy of the FCO) shows Gillian meeting Conrad at the Foreign Office on 30th October 2008. Gillian Merron, the Overseas Territories Minister at the Foreign and Commonwealth Office in the UK, hosted the tenth meeting of the Overseas Territories Consultative Council in London on 28-29 October. 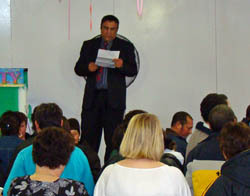 Chief Islander Conrad Glass led the Tristan da Cunha delegation to the meeting. Premiers, Chief Ministers, Councillors and representatives from other Overseas Territories also attended the meeting. Conrad Glass had a productive individual discussion with Minister. This was the first time a Tristan Chief Islander has had such an opportunity. The key issue for Conrad Glass was to increase revenue for the island, which the Minister agreed with and added that it is important for the Island Government to take control of expenditure. Discussion also touched on Tristan’s profile and the need for Tristan to work with HMG and St Helena for the future development of the island. 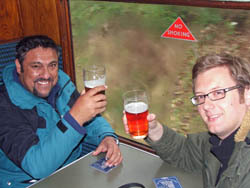 Tristan da Cunha's Chief Islander Conrad Glass attended the latest OTCC meeting in London on 28th - 29th October 2008. 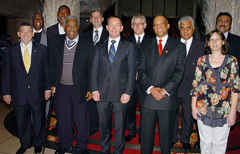 The photograph above (courtesy of the UK FCO Office) shows Foreign Office Minister Gillian Merron with the Hon Osbourne Fleming, Chief Minister, Anguilla; Hon Ewart F Brown, Premier of Bermuda; Hon Ralph O'Neal, Premier, the British Virgin Islands; Hon Kurt Tibbetts, Leader of Government Business, the Cayman Islands; Hon Michael Summers, Executive Councillor, the Falkland Islands; Hon Lowell Lewis, Chief Minister, Montserrat; Mr Leslie Jaques, Commissioner, Pitcairn Islands; Hon William Drabble, Councillor, St Helena; Hon Michael Misick, Premier, the Turks and Caicos Islands; and Mr Conrad Glass, Chief Islander, Tristan da Cunha during the Overseas Territories Consultative Council meeting in London, 28th October 2008. Conrad is pictured fourth from the right. This is the tenth meeting of the Overseas Territories Consultative Council (OTCC) and is hosted by Foreign Office Minister Gillian Merron. 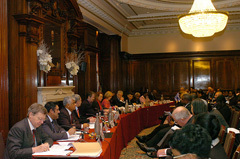 The OTCC, held each year in London , is a key annual event in the British Government/Overseas Territories calendar, providing a forum for the elected leaders of Britain 's Overseas Territories and their representatives to discuss high-level policy with a team of British Government Ministers. The Overseas Territories Consultative Council was established as a result of the 1999 White Paper Partnership for Progress and Prosperity on the UK ’s relationship with the Overseas Territories. Discussions are expected to cover a range of current issues including economic issues and the current global crisis; financial services regulation; human rights; prospects for the relationship between the EU and the Overseas Territories ; the environment and disaster management. Proceedings will include the signing of a new Tax Information Exchange Arrangement between the UK and the British Virgin Islands . "I’m glad to be welcoming so many elected leaders from the Overseas Territories and senior ministers to the OTCC this year. The forum is a critical part of debate and decision-making between the UK and the Overseas Territories . We’ve got a great deal to discuss – from financial services to human rights - I’m looking forward to getting down to the business of ensuring continuing close relations and the security and prosperity of the OTs." The British Government team will be led by Gillian Merron, who will be joined by Michael Foster MP, the Parliamentary Under-Secretary of State at the Department for International Development; the Rt hon Stephen Timms MP, the Financial Secretary to HM Treasury; Gareth Thomas MP, Minister of State at the Department for Business Enterprise and Regulatory Reform; and Huw Irranca-Davies MP, the Minister for the Natural and Marine Environment, Wildlife and Rural Affairs at the Department for the Environment, Food and Rural Affairs. Conrad Glass has made a written submission to the House of Commons Foreign Affairs Select Committee in which he first introduces himself and the island's background. He goes on to draw attention to some of the current economic problems and their impact on the welfare of the community. Conrad makes a plea for a qualified UK teacher to work in St Mary's School and give the local staff appropriate in-service training. He also requests support to purchase new school computers, and organise management training for Heads of Department and specialist training for other key workers. Conrad highlights the need for an upgrade in Camogli Hospital's building and facilities, including an additional ward and enhanced emergency, dispensary, and labour facilities. He also requests funds to purchase equipment including a patient monitor (ECG, NIBP, SpO2 Respirations), a theatre light, theatre operating table, resuscitation table/gurney, emergency operating light , ultrasound scanner, gastroscope, ECG monitor/defibrillator, sigmoidoscope, UV Filter for hospital water supply and, Paqa lab test kit. Conrad draws attention to to the fact that this equipment is essential to a doctor working in such a remote community. It means the difference between life and death. Conrad draws attention also to the fact that the only island shop is outdated and has inadequate storage facilities. He recommends a new building which would meet modern environmental standards. Particular requirements are new cold storage for meats and fruit, new computers for stock and cash flow systems, better shelving, new food preparation facilities and an upgrade of facilities for personal facilities for employees. and we will publish any subsequent reference to the submission on our Tristan in Parliament Page in due course. I would like to welcome you all to my first Old Year's Night reception as Chief Islander. 2007 has had its good and bad points for each member of the community, and we do not know what 2008 has in store for us. But as long as the community remain united as one family, we will persevere in the face of adversity. Together we have stood steadfast through a volcano and a hurricane. As our motto states, Our faith is our strength. On behalf of my family, I wish you all a Happy and Prosperous New Year. See also Pictures and Report of Old Year's Night on our Christmas and New Year Holiday Page. The Chief Islander and Anglican community would like to express their sincere thanks to Bishop Christopher, for confirming many children on Tristan, and for his three weeks ministry during the visit of the SA Agulhas. Bishop Christopher volunteered for this job knowing he would not be paid, and will be away from his family for five weeks. I would like to take this opportunity, to welcome to Tristan all our visitors, especially the new Administrator Mr & Mrs Morley and all returning Tristanians. * Stopping the drain on our financial resources, so our revenue outweighs expenditure. * Getting a decent harbour, which is the lifeline for the island. I know these issues are top of the Administrator’s agenda, and he will need the help & support of the community to achieve this. As Chief islander I will do my utmost, to help and support the Community and Administrator. During my three years as Chief Islander I pledge to serve the best interests of the community. To this end I bring the same ethics and morals as I apply as community police officer. Finally I would like to wish Mike & Janice Hentley, who are on their way to Gough at present, a long and happy retirement.